Connected Health » Fitness Gadgets » Will the Nike+ FuelBand be the best daily tracking fitness gadget in 2012? 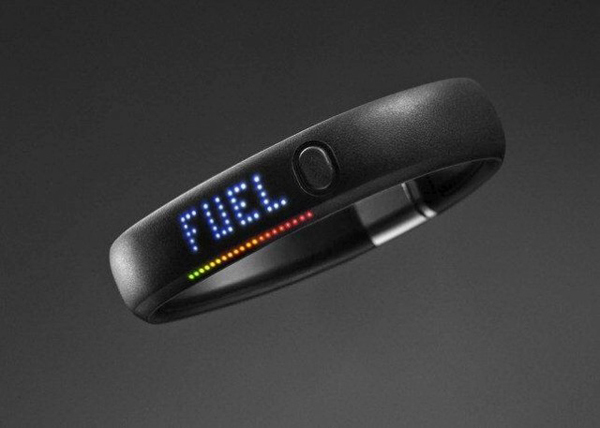 Will the Nike+ FuelBand be the best daily tracking fitness gadget in 2012? Nike has added a new gadget to its range of digital fitness products this week. The new Nike+FuelBand sits on a user’s wrist, and has been designed to track everyday movements that could encourage people to live more active lives, much like the devices we saw at CES, like the Iqua Beat and Valencell’s earbuds. The band pairs up with the current Nike+ website or free iOS app over Bluetooth, the Nike+FuelBand uses an incentive system called NikeFuel, which is a normalised score that awards equal points for the same activity regardless of physical makeup, users can then set a daily goal of how much NikeFuel they want to earn through being active during the day. Whereas previous Nike fitness systems have required users to set aside time for a workout, the FuelBand instead uses four slightly more passive metrics (Time, Calories, Steps and NikeFuel) that can be tracked throughout an entire day, letting users gradually adapt their days to make them a little more active. The wristband itself lets you track how close you’ve come to reaching your target goals over a day through a series of 20 LED lights, gradually building from red to green as you approach your set achievements. “The Nike+ FuelBand is a way for Nike to further evolve the exciting possibilities of merging the physical and digital worlds,” said Nike, Inc. President & CEO Mark Parker. The Nike+ FuelBand already has the backing of some major names in the world of sport too, including seven-time Tour de France champion Lance Armstong, Oklahoma City scoring champion Kevin Durant and 2011 IAAF women’s 100 metres World Champion Carmelita Jeter. “What’s great about the idea of NikeFuel and the FuelBand is the way it provides real information and numbers to show how much people are doing all day, every day,” said Armstrong. Even though the Nike+ FuelBand may be very similar to a lot of other gadgets we’ve been coming across in recent months, the brand’s following, Nike+ dashboard and dedication to changing the way we view fitness could mean it becomes one of the most popular options when it’s released in May of this year. 2 Responses to "Will the Nike+ FuelBand be the best daily tracking fitness gadget in 2012?"